Next morning before we left Udawalawa we visited another hotel that we use in our superior hotels category. It is called Kalu’s Hideaway. Cricket fans might remember the famous Sri Lankan cricketer Mr Romesh Kaluwitharana in the nineties. He is now retired from cricket and has built his lovely retreat set in acres of beautiful gardens. The entrance to any hotel is normally a good indicator of the kind of hotel and Kalu’s hotel has the best entrance of a boutique hotel in the area. It is stylish and simple, warm and welcoming which reflects the character of the hotel. We were lucky that morning as Mr Kalu and his family were staying at the hotel for the weekend. We were able to have a long conversaion with him as he showed us around the hotel. He even took us up to the best room at the hotel, the panoramic suite where he was staying with his family. The suite is very private on the top of the building with a large roof terrace having panoramic views of surrounding forestry. He even showed us that sitting on the bed you can still see this wonderful view without getting up. We will be offering this suite, if available, for our new Sri Lanka Deluxe itinerary. The rest of the rooms are spacious and well presented. I particularly like the superior room where each room opens to a small private courtyard at the back. There is also a lovely swimming pool in the gardens. At the end of the garden runs a small river where clients can go boating. 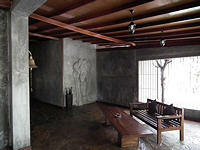 We are going to use Kalu’s Hideaway for both superior and deluxe hotels category from now on. We drove onto Yala and checked in at Cinnamon Wild. This is another unique hotel that is actually in the National Park and so animals can wander in and out of the hotel at will. 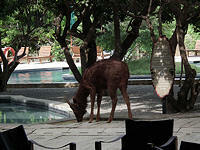 We saw monkeys, deer and wild pigs on the paths as well as in the hotel reception area. There are crocodiles on the lake behind the hotel swimming pool but they at a distance and guests are not allowed near the lake. There is a sandy beach too at one side of the hotel but although lovely for a walk, the sea here is too rough and the currents to dangerous for swimming. At night time hotel guests have to inform the hotel staff if they want to come to the bar or restaurant and a man with a torch will be sent to lead the way for guests. It is all quite fun and adventurous. All rooms are chalet style. The room is medium size with the bed the dominant feature of the room. The decor of the room makes one feel like being in a safari hut or tent especially the mosquito net over the bed and the canvas chairs and wooden furniture. This afternoon we began our second safari trip in Yala National Park. I found Yala safari a disappointment for a number of reasons. Firstly there was no government-employed park guide to accompany us on our safari. 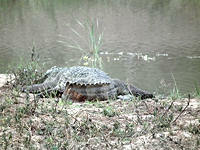 Secondly Yala National park is large and very famous so there were more visitors and jeeps around. On our trip there were about 30 jeeps or more following us around everywhere. This was the beginning of the low season in late April and early May. In high season from October to March there would be hundreds of jeeps and more in the park all visiting at the same time. When a leopard was spotted on a tree in the distance all the jeeps raced to the spot and joined the queue to take photographs. There were so many jeeps and people blocking the view but we managed to see him and took the photos. On the whole we did not enjoy Yala safari as much as we did to Udawalawa safari. In Yala it took us a long while to spot any animals. We saw more elephants in Udawalawa than in Yala. Also maybe too many jeeps being around caused one large male elephant to start losing his cool and become aggressive by rolling up his trunk for attack. All the jeeps were driving too fast and noisily too. It was not a very good experience for us. On top of that we felt two days safari in a row is a bit too heavy for those who are not very keen on wildlife. 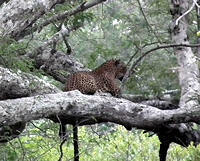 We are going to take out Yala safari and keep one safari in Udawalawa for our itinerary now. Next morning before we left Yala we inspected two more hotels. One is the newly opened Jetwing Yala. The other is the Elephant Reach. We use this hotel in our superior hotels category. This simple hotel is surrounded by gardens, lawn and trees. 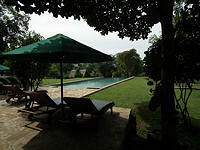 The lovely swimming pool is circled by cottage style bungalows. The rooms are large and comfortable. There are chairs and table on the patio outside the front door. A pleasant simple hotel. According to our 14 day itinerary we drove next day from Yala to Mirissa and stopped for one night. This is to break the long drive from Yala to Bentota Beach resort. Since Mirissa is also a beach resort we found that another night on the beach before beach resort is not really needed. We also found the resort where we stayed for the night also not suitable for our clients so decided to take out this one day/night in Mirissa to add it to the next historical city and fort of Galle.